Orbie (formerly Kemo), the blind pit bull rescued by Oakland Animal Services (OAS) in California, has been settling in to his new temporary home at Phoenix Cottage. Orbie spent six months waiting in the shelter, and Our Pack, Inc brought Mutts-n-Stuff and OAS together. Northern California rescues, including Our Pack, took over 50 dogs from last year’s Big MO Bust; this was our opportunity to repay them by helping one of their dogs with special needs. Mutts-n-Stuff has extensive experience working with disabled dogs. 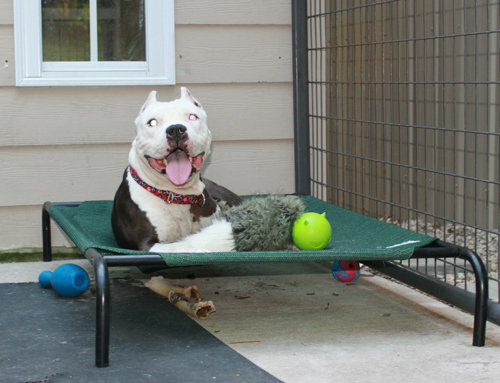 In fact, Phoenix Cottage was built especially for blind pit bull Phoenix. Phoenix passed on to the Rainbow Bridge earlier this year, and his family could think of nothing better than for another blind pit bull to find comfort and happiness in his special cottage. Orbie’s foster mom and dad are discovering that he is a very social dog, and loves to play and snuggle with any human that crosses his path. Orbie loves toys; he squeaks and squeaks his Cuz endlessly. Due to his blindness, Orbie cannot read the body language of other dogs and is hesitant to interact with them. He relies on humans to be his guide and is responding exceptionally well to clicker training combined with verbal cues, which is especially helpful on walks. Two clicks = obstacle ahead, one click = let’s go, etc. Orbie also has learned sit, down, and roll over. His positive interaction with humans is helping him learn to trust and build relationships with people. Orbie’s blindness may be due to macular degeneration, and he will very soon be visiting a specialist to determine if his eyesight can be at least partially restored. Regardless of his ability to see or not, Orbie is a sweet, loving, and patient boy who will soon be looking for his special forever home. Check back with us for updates on his progress and adoption availability.